First looking at the photostream of Dan Reed, I puzzled over the perspective and subjects, which are unlike anything else yet featured in this series. He shoots streets, buildings, and such from vantage points that are atypical. Then I read his bio. He’s an architect and city planner. Dan looks at things with a dramatically different eye than I would; he sees things in another context that is refreshing and revealing. Dan shares his insights at blog “Just Up the Pike“, which refers to Maryland Route 29, or Columbia Pike. Our daughter was born when we lived off 29, just outside Silver Spring, which is Dan’s hometown. 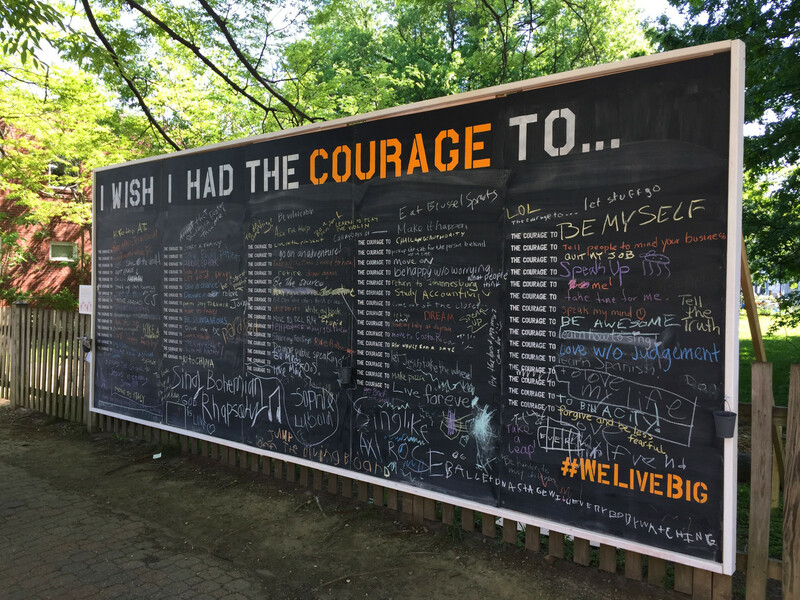 Self-titled “The Courage Wall” doesn’t represent his photographic perspective but does capture the aspirational essence behind his profession and blog. He used iPhone 6 on May 14, 2015, not long before the large chalkboard was removed from its Virginia location and set out for new destination. Vitals: f/2.2, ISO 32, f/151, 4.2mm. My entire life I had dreamed of being an architect and had built an identity around it. But I struggled with math and physics, and I felt disconnected from the people and communities I was supposed to design for. My time in Del Ray taught me something new about myself, and it gave me the courage to take the leap and try a different path. Seven years later, I’m a urban planner. For other people, the Wall of course meant something else: Courage to overcome, as Dan already has done. You can read some their aspirations in his Flickr album.